Not all Halloween decor has to be spooky or scary. 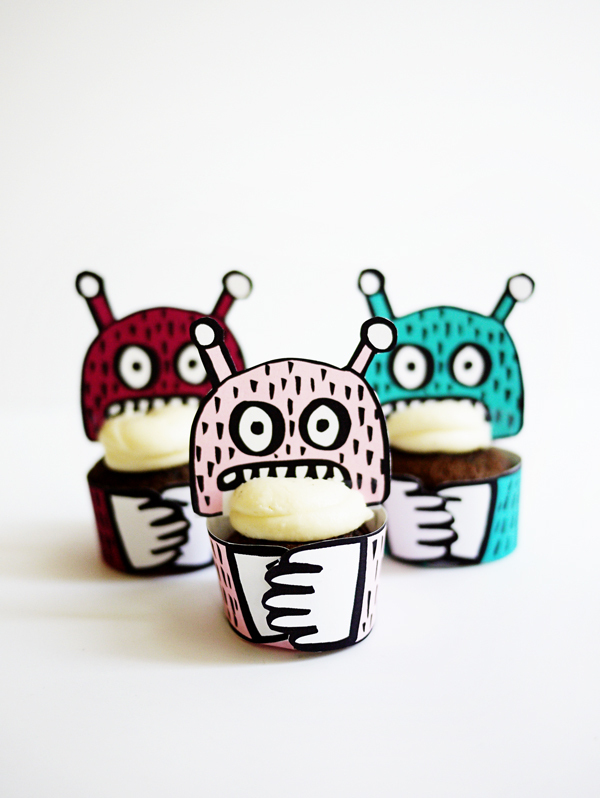 If your in the mood for something silly then try these easy to make monster mini-cupcake holders! 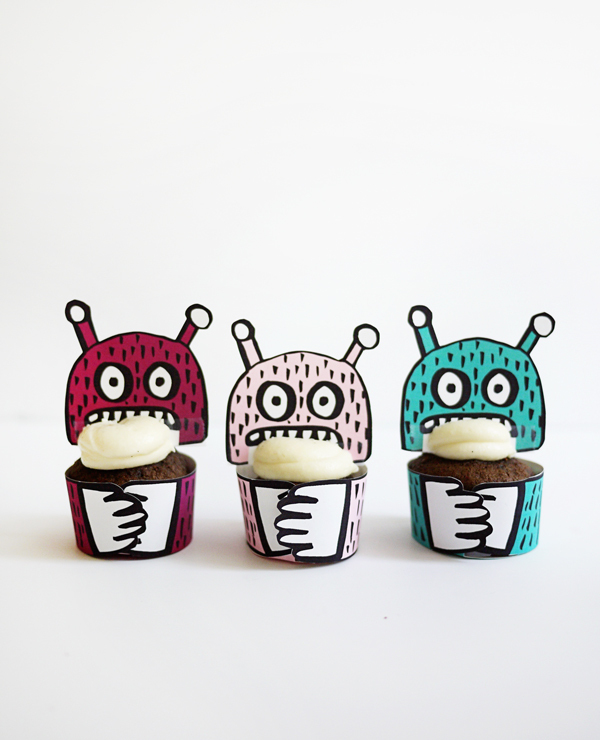 You might not be scared of the these little creatures in the dark but you will certainly feel terrified they might eat all of the cupcakes! 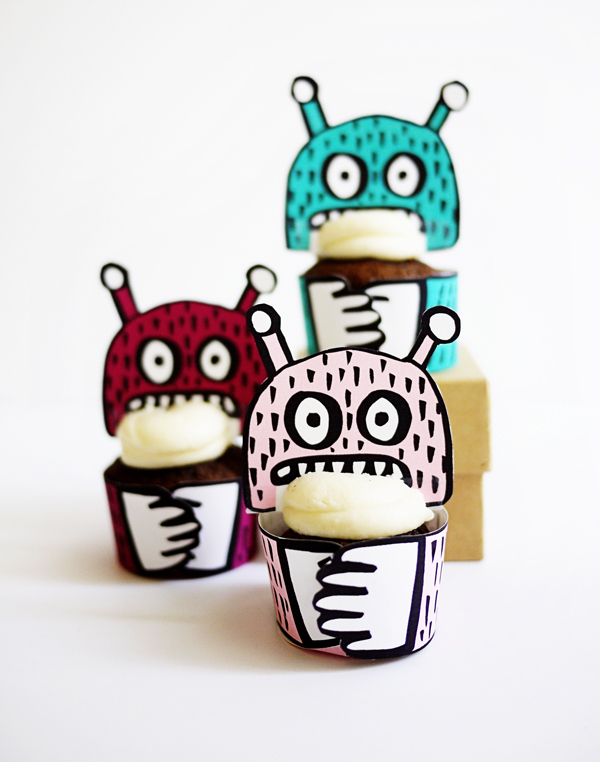 Step 1: Print out the Printable Monster Cupcake Holder Template on 8.5 x 11 card stock. Step 2: Cut out the the of the pieces of the template using scissors. Step 3: On each monster head fold over a piece of scotch tape over the mouth area. This part will stick into the cupcake. Step 4: Take the round bottom template and fold in each of the tabs. Step 5: Put a small piece of tape on all four tabs. Make sure the sticky side is facing out. Step 6: Place a cupcake on the bottom piece. Press the taped tabs up a bit then wrap the arms piece around the cupcake. 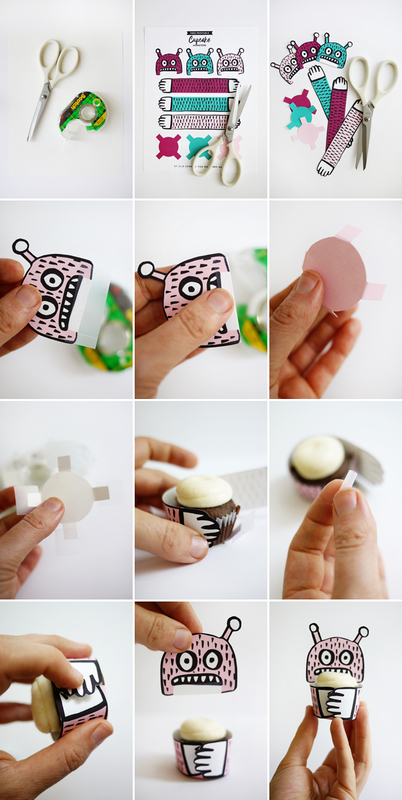 You may need to remove the cupcake after to secure the tape to the arms after you wrap it. Step 7: Make a small donut shape with a small piece of tape and use it to secure the hands down. Step 8. 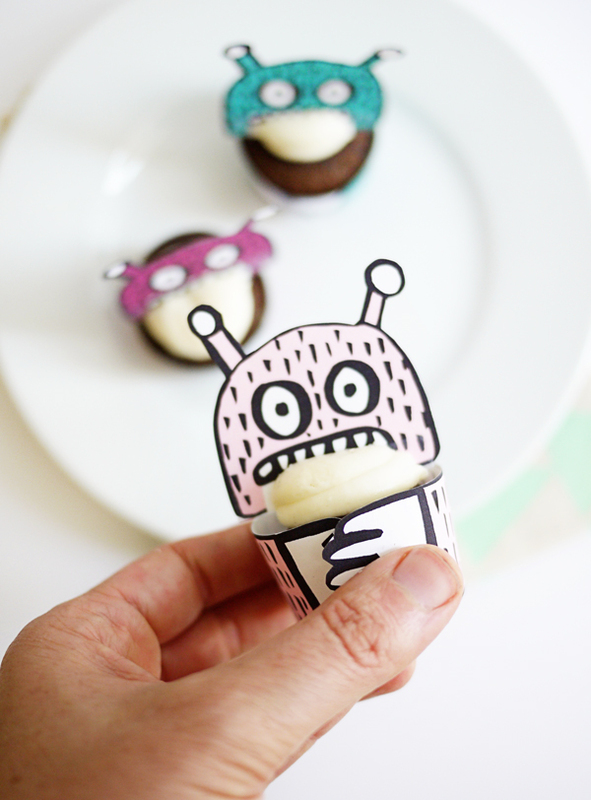 Stick the monster head in the cupcakes! Step 9: Eat the cupcake before the monster does! My three-year-old, Vera, would love these! We might have to make them this week. She likes to pretend she is at a party anytime we eat these days and also talks about Halloween every.single.day. These are too cute! I love them. Thank you, thank you! We’re throwing a Halloween party and have been looking for decorations that are beyond the usual spooky, dark stuff out there. These are too cute! OMG these are too cute! I can’t wait to use these for a party. Halloween perhaps? Maybe I will make some for my 20th birthday.. is that sad? !